It had been one of the most eagerly anticipated launches of recent years, the subject of more rumor and speculation than a Hollywood scandal. But when the London Boat Show opened in January, there she was. 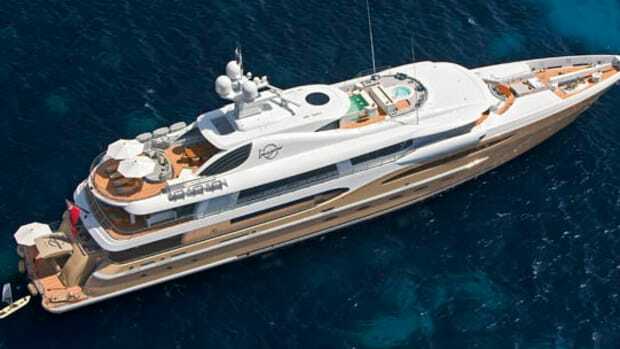 Finally, large as life and twice as opulent: Sunseeker&apos;s latest, the 37M Trideck Yacht, all 121 feet and 180 tons of her. 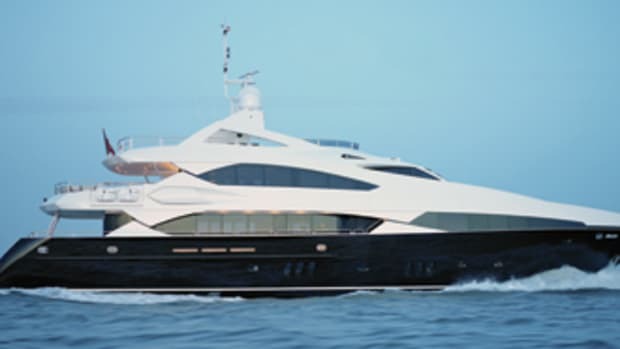 Immediately the company&apos;s previous flagship, the 105-foot flying-bridge motoryacht, looked small. 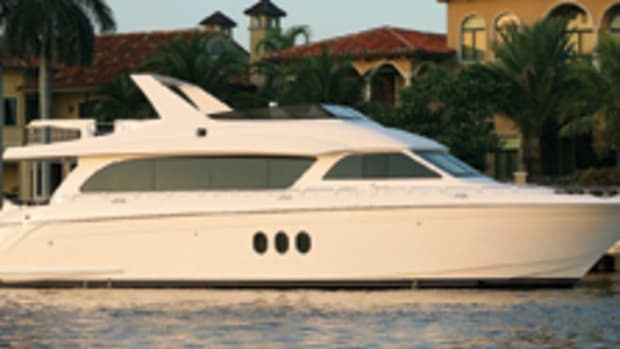 Sunseeker’s largest launch packs a punch in looks and performance. "This is twice as much boat as the 105," explains yard manager Stefan Whitmarsh with pride. "Twice the volume, twice the displacement." Trideck performance motoryachts are not as rare as they used to be—even those that pack 5,600 hp and display the sort of rakish charm that wouldn&apos;t look out of place as the personal plaything of a Bond villain. But although nothing like this has emerged from a British shipyard before, that wasn&apos;t the most intriguing thing about her. 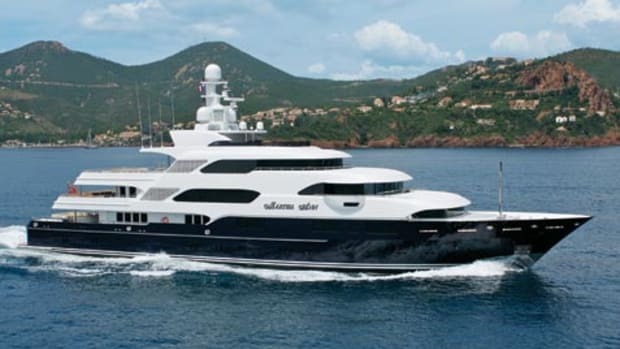 What no one could figure out at first was how Sunseeker had made her seem so big inside. And it does take a bit of working out. 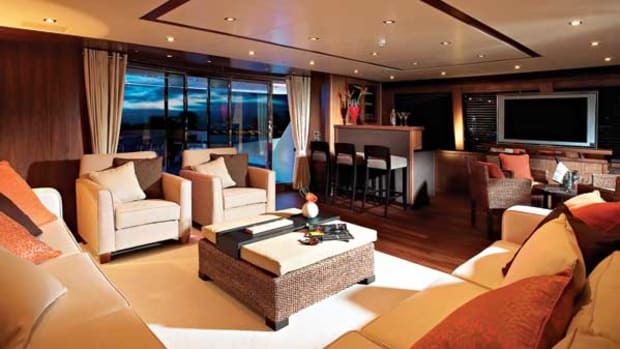 This is a yacht with four big en suite guest cabins, an improbably large, full-beam owner&apos;s suite, and an upper lounge/bar that seems almost as generously proportioned as the main saloon below. The sheer quantity of internal volume available for the accommodation seems to be the result of some cunning sleight of hand, as if it has been borrowed from a bigger boat. 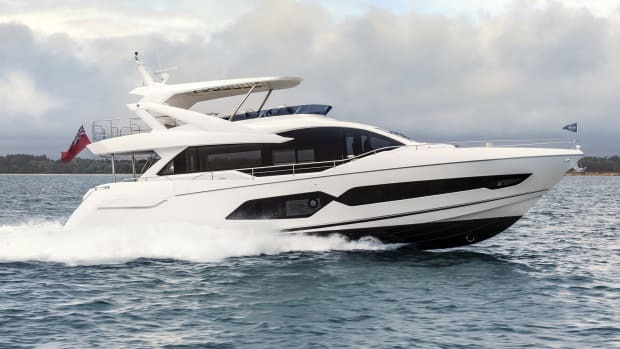 Although there has been some clever lateral thinking, the idea has come not from bigger boats, but from the smaller sport cruisers that have been Sunseeker&apos;s stock in trade for decades. At a stroke, simply raising the foredeck has given the owner&apos;s suite the best of both worlds: the width of the yacht&apos;s full beam, combined with the light and window area of the main deck. 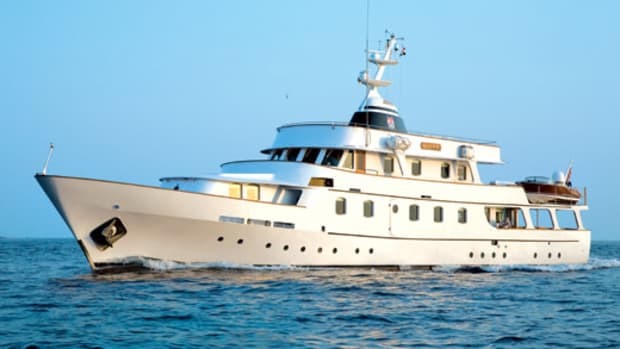 In spite of first impressions from outside, the foredeck slopes upward from the bow to the wheelhouse windows and is reached from each side deck via a set of steps just forward of midships. 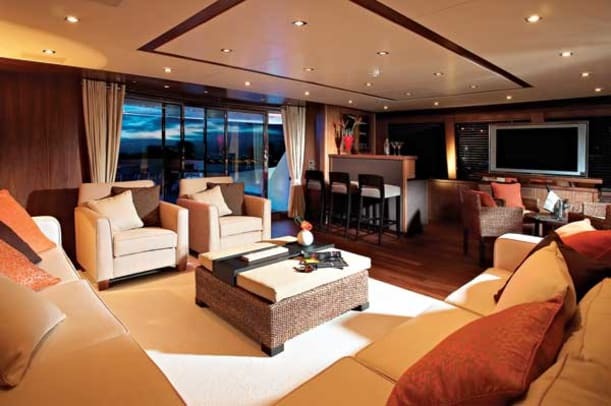 Not content with that, the designers then took the idea upstairs and stretched the upper lounge and its attendant "balcony" across the full beam, too, giving the upper deck the sort of floor space you&apos;d normally expect only on the main deck of a yacht this size. Space: Like oxygen, you take it for granted until you find yourself without quite enough of it. Which is why on boats it&apos;s the ultimate luxury—particularly boats designed with the charter market in mind. 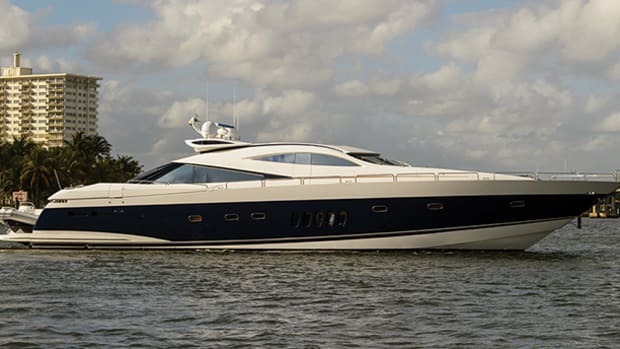 The Sunseeker 37M satisfies both RINA and MCA regulations, and with two doubles on the lower deck plus two twin en suites with fold-down Pullman berths, this is a yacht that can accommodate up to 12 guests. Even with the option of a full-beam VIP suite instead of the two doubles, she still sleeps ten. But, with its restful scheme of cream and beige, walnut veneers, and solid walnut joinery, there is nowhere in the guest accommodation that feels at all cramped. The guest cabins below are arranged symmetrically around a central lobby, which is reached down a spiral staircase on the starboard side, and each has an unusually spacious head and plenty of stowage. The crew quarters, three cabins with six berths plus a comfortable dinette and auxiliary galley, occupy the forward sections, accessed via the main galley. The piece de resistance, though, is the master suite in the bow, which you find down the starboard corridor from the saloon, past the day heads. Here you enter full-beam territory, with huge superstructure windows that flood the space with light. The bed is offset slightly to port, making way for a pair of freestanding armchairs and a coffee table. The walk-in wardrobe on the port side forward does, for once, fully deserve that description, while the MSD and bidet have their own compartment with a basin to starboard. Down four steps leading forward, you find yourself in a domestic-size bathroom, with a pair of sinks, a big shower on the port side, a bath to starboard, and plenty of floor between them. 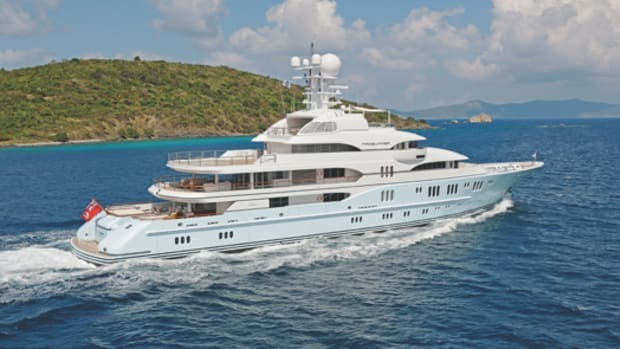 This article originally appeared in the June 2007 issue of Power & Motoryacht magazine.